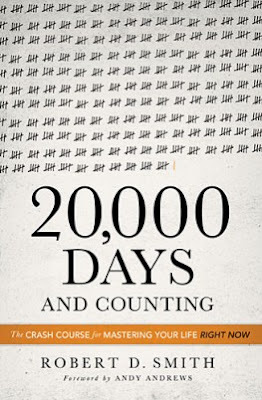 20,000 Days and Counting: The Crash Course for Mastering Life Right Now is a 2013 Christian motivational book by Robert D. Smith. Smith takes, from a Christian worldview, a memento mori, live-each-day-as-if-it-were-your-last approach to living life with greater purpose, which includes the pursuit of personal goals, the appreciation of personal relationships, and the dedication of life to God. Smith also offers advice on conquering rejection, taking a proactive approach to self-improvement, and working through a lack of motivation. This book is extremely short (it’s designed to be read in an hour), and while Smith offers some planning exercises and steps the reader can take to live life with more purpose, it nonetheless feels rather general. Some of Smith’s suggestions are concrete and feasible (for example, his “ten things you can do now”), but others, like, “Draft your life’s story, then live it,” may strike the reader as too broad and sentimental to actually sit down and do. What Smith has to say is generally quite good, even if it’s nothing new; it’s just that he’s one of those super-intense, jump-out-of-bed-and-go types that the rest of us can find off-putting – it’s not so easy, after all, to get from here to there, or else we’d all be like that. In other words, while it’s relatively easy for the reader to accept Smith’s life principles and try to remember and implement them, it’s somewhat less likely that the average reader will run down the field with Smith’s exercises. 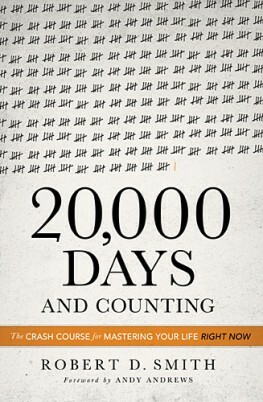 In short, then, 20,000 Days and Counting is a helpful but general book; ultimately, how useful it is to you is going to depend almost entirely on how much you’re willing to put into it.